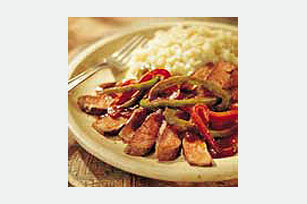 If you've got a boneless beef top round steak and six pepper-loving people to serve in under 30 minutes—this is the recipe to make! Preheat grill to medium-high heat. Cook and stir peppers in hot oil in large skillet on medium-high heat 5 min. or until crisp-tender. Stir in steak sauce and sherry. Reduce heat to low; simmer 5 min., stirring occasionally. Keep warm. Grill steak 4 to 6 min. on each side or until cooked through. Cut steak into thin slices. Serve with the steak sauce mixture. Prepare as directed, using A.1. Bold & Spicy Steak Sauce. Substitute water for the sherry. To cook steak under the broiler, place steak on rack of broiler pan. Broil, 4 to 6 inches from heat, 4 to 6 min. on each side or until cooked through.